Sometimes, seeing plants growing in a landscape visually helps decide whether we want it in our yard to begin with and sparks ideas for possible companion plants that play off of color and texture. Plus, though lining up plants in gallon containers next to each other at the nursery is helpful, this method doesn’t necessarily give you a feel for how they’ll look together at maturity. The solution—go outside and get inspired in scenic San Diego gardens. We’re lucky to have four gardens accessible to the public that are not only home to beautiful landscapes, but they double as fun places to bring the kids and even the dog, in some cases. San Diegans are fortunate to have the nation’s largest urban cultural park, Balboa Park, as a resource with gorgeous gardens surrounding its world-class museums. The gardens of Balboa Park are free to roam, including the tranquil 2.5-acre Desert Garden (pictured above) that’s home to over 1300 plants. As the name implies, plants living here can survive in low-water Southern California gardens and are ideal candidates for xeriscaping, which is a design philosophy based on reducing overall irrigation needs. This garden is a bit off the beaten path but peaceful and full of birds, lizards and other wildlife that freely roam the grounds. Speaking of animals, dogs are welcome and you’re likely to spot the occasional photographer or jogger taking advantage of the scenic trails. Bring a picnic lunch (there are a few benches) and the kids, though you’ll need to make sure curious fingers stay well away from prickly cacti. Download the garden map, which outlines wheelchair accessible trails and notable plants to spot (perhaps a game of, “I Spy” with the kids is in order). Design ideas likely to be found here include ways to incorporate textures of various cacti or succulents and if you visit between January and March, this is the garden’s peak blooming period which may sell you on one plant option versus another. The Desert Garden is sometimes confused with the 1935 (Old) Cactus Garden, which is another spot worth checking out in order to see Balboa Park’s largest cacti and decorative protea plants. Also located in Balboa Park, the California Native Plant Garden is a demonstration garden specifically designed to show homeowners the potential of landscaping with California native plants. 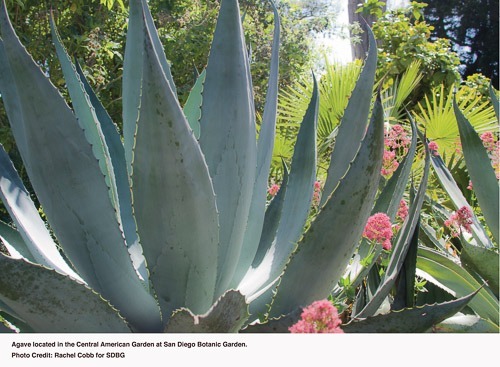 Grab the descriptive brochure which outlines 36 of the 100 native plants in the garden that are suggested for easy home use, though the garden is home to 2000 plants that are native to San Diego. A quarter-mile, rustic trail winds visitors through the scenic garden that now spans 5 acres. You can even contribute to the garden during the monthly work parties held on the second Saturday of each month from 9:00am-12:00noon, which may be another opportunity to learn about the upkeep and seek further advice regarding native plants you’re considering. Parking is fairly easy, bathrooms are within a short walk and the garden is free to enter 365 days per year. Formerly known as the Quail Botanic Gardens, the San Diego Botanic Gardens in Encinitas offers guests a mix of exotic and native plants to admire. 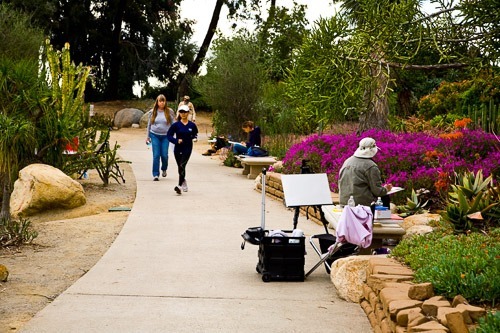 It does matter what kind of garden design you’re planning to implement, because the San Diego Botanic Gardens has an enormous variety of plants from all over the world. The garden is split up into a variety of themed gardens ranging from the African Garden full of unusual plants to the Bamboo Garden, which houses the nation’s largest collection of bamboo. Homeowners planning water-wise landscapes may want to look at the colorful Succulent Garden to see how they use companion plants to accentuate texture, the New World Desert Garden to look at more agaves, succulents and cacti or the Central America garden to see plants native to Southern Mexico and Central America. 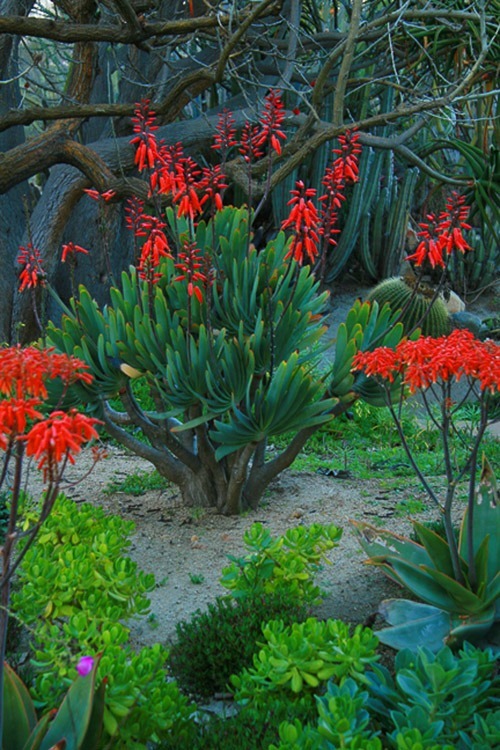 For homeowners in areas where fire is a risk, the San Diego Botanic Garden has an area dedicated to planting a fire-resistant landscape. If the kids are in tow, Hamilton Children’s Garden is a playground complete with a tree house and special hands-on events on Fridays where kids can create art projects or even help garden. Admission is $14 per adult and $8 per child with children ages 2 and under free, however, admission is waived entirely on the first Tuesday of every month. Located at Cuyamaca College in El Cajon, The Water Conservation Garden is open for guests to wander through a series of themed gardens designed to showcase low water usage. Admission is free and you can tour the garden on your own, through a tour, or by enrolling classes open to the general public, however, the garden is also a popular place for school field trips where kids learn the importance of conserving water on a tour with Mrs. Smarty-Plants, the lively garden educator. The themed gardens are extremely practical for homeowners as they are divided by specific need and showcase options right next to each other. For example, the turf exhibit lines up seven different types of lawn to consider while outlining water and maintenance requirements along with whether or not the turf is a pet-friendly choice. But if you’re thinking about scrapping turf all together, walk over to the ground-cover exhibit where plant and hardscape turf-alternatives are lined up next to each other. Do bring the kids, as they can quite literally get their hands dirty here while learning to compost with worms and all. Take a virtual tour of the garden by watching this helpful video. Tip: Make sure to bring a camera or a notepad to capture design ideas that you like though if it’s too much to write things down with kids in tow, for example, photograph the plant and then a close-up of the plant name plates, especially if they have care and size details. This way you can bring photos or simply your camera to the local nursery to help staff locate the correct plant(s). Where in San Diego do you go for landscape design inspiration?